this pub has a very strong Canadian influence. Sleeman’s, Moose Head and Molson Canadian. We worked closely with the designers to bring their visuals to life. with a hand painted 3D relief Maple leaf and gold leaf house name. The main pub signs, amenity boards and A-boards are aluminium sprayed in Spanish Brown for the background and gloss black for the bullnose. The Spanish brown and burnished Gold leaf compliment each on the glass fascias. 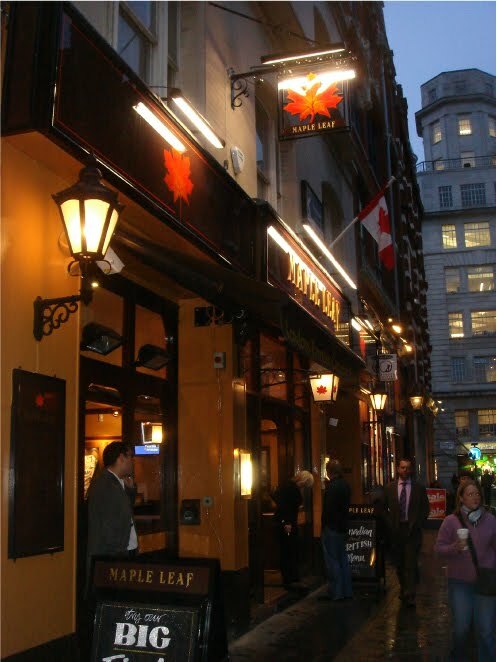 The Maple Leaf looks great at night with our trough lights and hand made brass lanterns.